NorthStar POS is an iPad-based point-of-sale system designed to streamline the workflows of businesses in the hospitality industry, including restaurants, bars, cafes, and fine dining establishments to name a few. The software comes with all the tools one would expect from a world-class point of sale system, including table management, order management, payment options, happy hour pricing, and pizza pricing among others. With NorthStar POS, taking orders is easy. Staff can take orders from their POS units. Guests can view and select their items at the table or from the mobile device. Guests can place their orders in the lobby before they are seated. They can even access the menu online and order through the web. Simply put, NorthStar POS revolutionizes the ordering process, streamlines the whole journey, gives customers an enjoyable experience, and ensures that businesses see their profitability improve immensely. NorthStar POS provides you with an innovative and robust point-of-sales system that speeds up the way you take and handle orders, effectively manage your kitchen operations, seat your guests, manage reservations, and more, all from your iPad device. With NorthStar POS, you can access the system from anywhere and make changes in your menu, view your reservations, modify prices, and check real-time data among others. Wherever you are and whenever you need to, NorthStar POS gives you the total view of your business and all its operations immediately and easily. With its five-mode ordering platform, NorthStar POS makes it easy for you to take orders while ensuring that your guests have a great and positive dining experience. By combining five ordering methods into a single solution, this next generation POS not only accelerates the ordering process but also enhances the engagement of your guests and empowers your staff to perform at their best since you can track their performance even when you are not around. NorthStar POS gives you flexibility and mobility. You can access the system and make the necessary adjustments you need for the day, such as items on the menu, prices, etc. You can check your inventory and supplies and make sure that you have everything you need to keep all your operations smooth. You can also keep tabs on your employees, their schedules, and breaks, as well as performance analysis. Powerful reporting tools allow you to see insights that will help you make intelligent decisions on the fly. From staffing to ordering to seating, NorthStar POS delivers all the information you need to determine what you can do to ensure profitability and how to do it. What Problems Will NorthStar POS Solve? As restaurant owners expand their brands, they encounter growing issues. Oftentimes the systems that got them to where they are are not the same systems that take them to the next level. 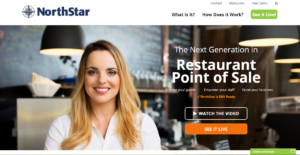 Managing restaurant operations using NorthStar POS enables operators to manage from anywhere and makes growing the brand easy. Managing images, pricing, and other attributed are managed from anywhere in the world. Restaurants are often challenged with EMV charge-backs. NorthStar POS is processor agnostic (not tied to one processor, the end user has a choice), all certified for EMV to eliminate costly charge backs. Finally, often times restaurant operators want to add things like mobile ordering, online ordering, tableside ordering or kiosk ordering to their restaurant. This integration is time consuming, costly, and can create headaches. NorthStar’s all-in-one platform makes ordering from anywhere a breeze. Since each organization has specific business needs, it is prudent for them to desist from looking for a one-size-fits-all ideal software system. Needless to say, it would be pointless to try to find such a platform even among market-leading software platforms. The clever thing to do would be to list the various vital aspects that need consideration such as key features, budget, skill levels of staff members, company size etc. Then, you should do your research thoroughly. Read some NorthStar POS reviews and investigate each of the other solutions in your shortlist in detail. Such comprehensive homework can make certain you discard ill-fitting systems and zero in on the system that provides all the elements you require for business success. How Much Does NorthStar POS Cost? We realize that when you make a decision to buy POS Software it’s important not only to see how experts evaluate it in their reviews, but also to find out if the real people and companies that buy it are actually satisfied with the product. That’s why we’ve created our behavior-based Customer Satisfaction Algorithm™ that gathers customer reviews, comments and NorthStar POS reviews across a wide range of social media sites. The data is then presented in an easy to digest form showing how many people had positive and negative experience with NorthStar POS. With that information at hand you should be equipped to make an informed buying decision that you won’t regret. What are NorthStar POS pricing details? What integrations are available for NorthStar POS?